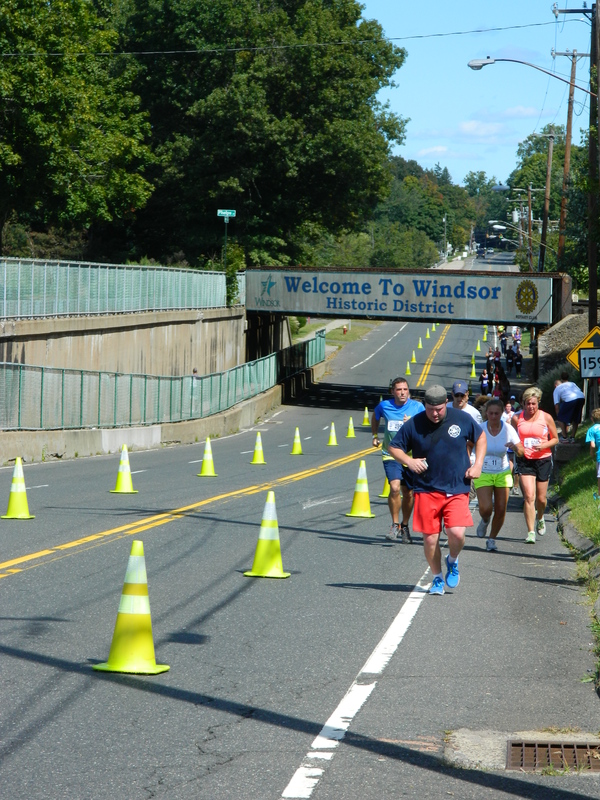 On yet another glorious weather day gracing the region, the 6th Annual Tavern Trot held September 16 in historic Windsor, Connecticut, drew a record number of participants. 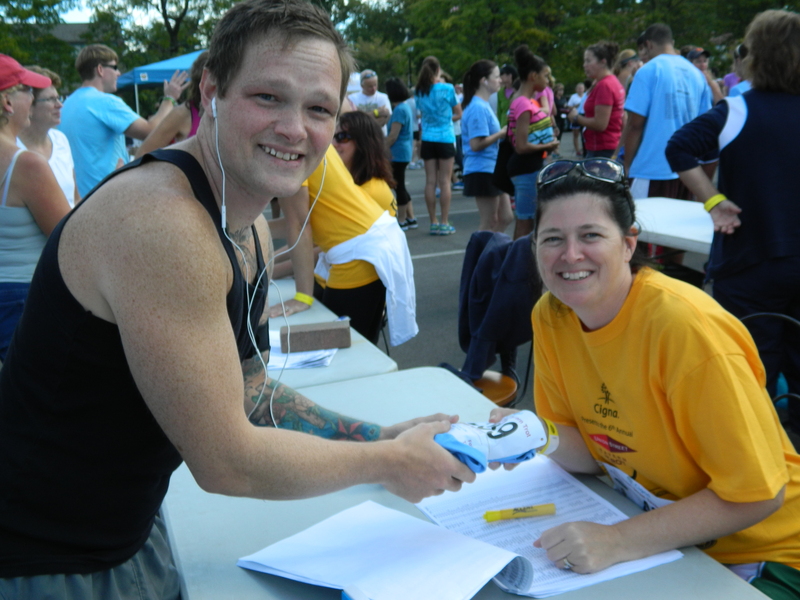 Surpassing a goal of seven hundred set by the event planning committee, a preliminary tally showed 742 runners and walkers had signed on by the close of registration at noontime Sunday. Michael Ganzano picks up sign-in information from Ellen Gilhooly. 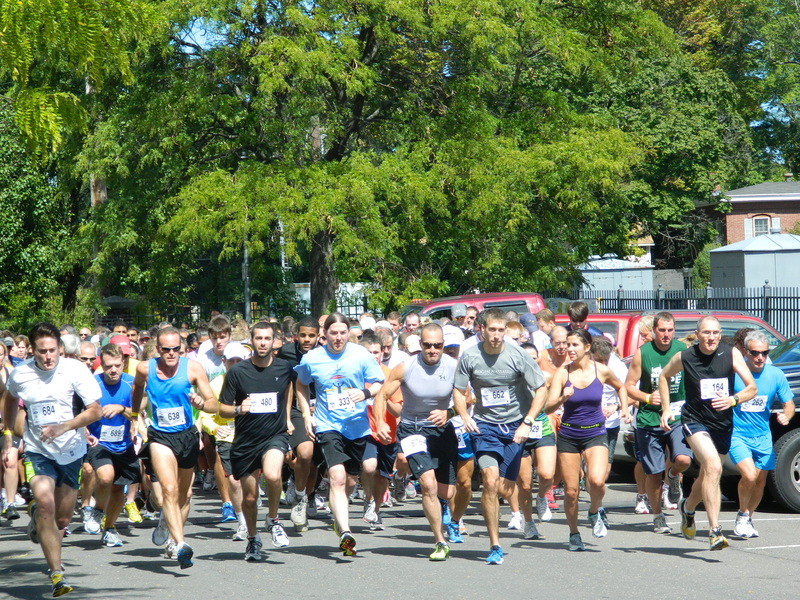 “We have a great turnout,” said Mike Deneen, a runner and part owner of the Union Street Tavern that hosted the 3.5 mile road race. 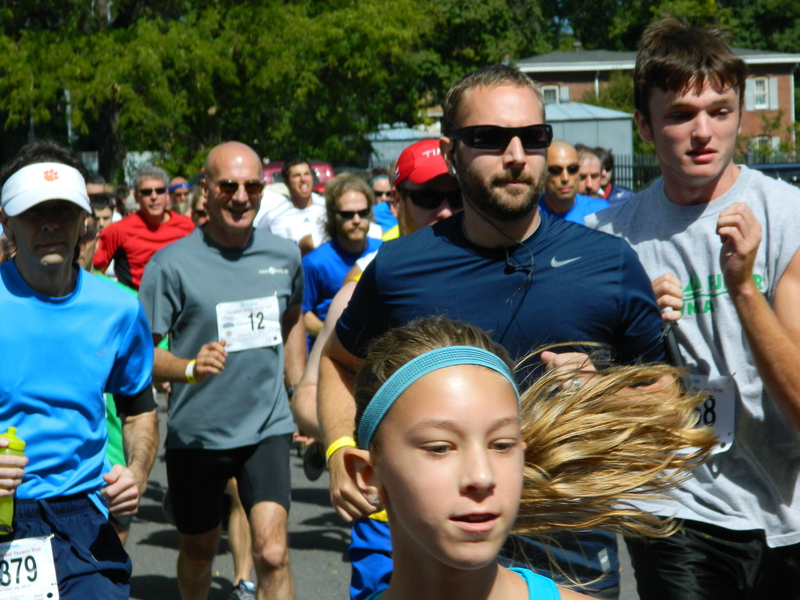 Running with the pack – Mike Dennen (in yellow shirt) part owner of Union Street Tavern. crowd of runners at they waited eagerly at the starting line. 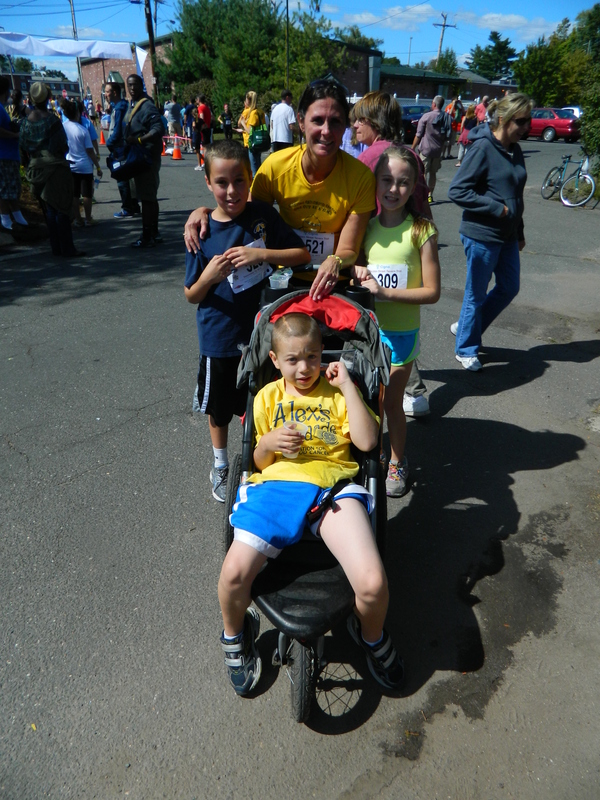 She then fell in at the rear of the racers, to walk with her nephew Alex Inytkin, 6, who has tubular sclerosis. 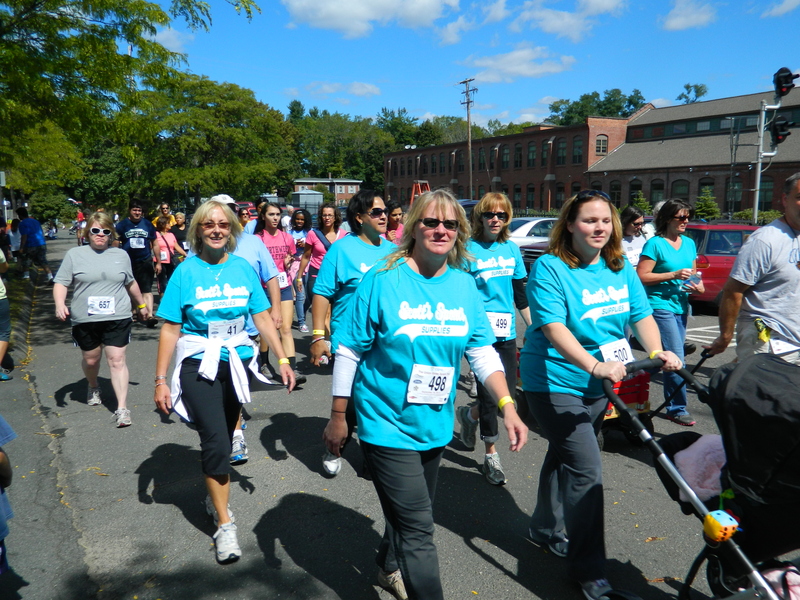 “Alex” Scott lost her battle with cancer in 2004 at age 8 and Liz Flynn Scott said she is amazed to see the growing number of activities that continue in her daughter’s memory. 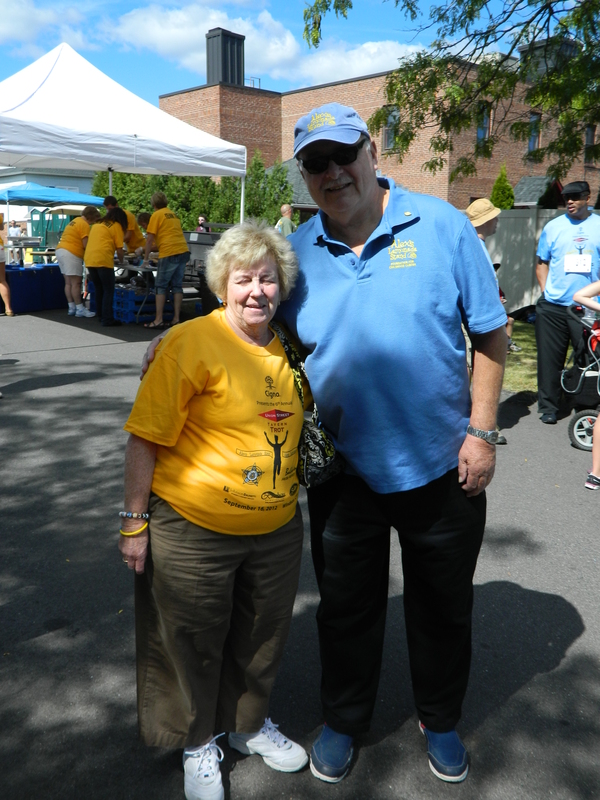 She noted she and, or, her husband Jay Scott who also grew up in Windsor, Conn., try to attend as many events as possible held for ALSF. Liz Flynn Scott is shown with her nephew Alex, niece Marina and her son (on left), Joey Scott. 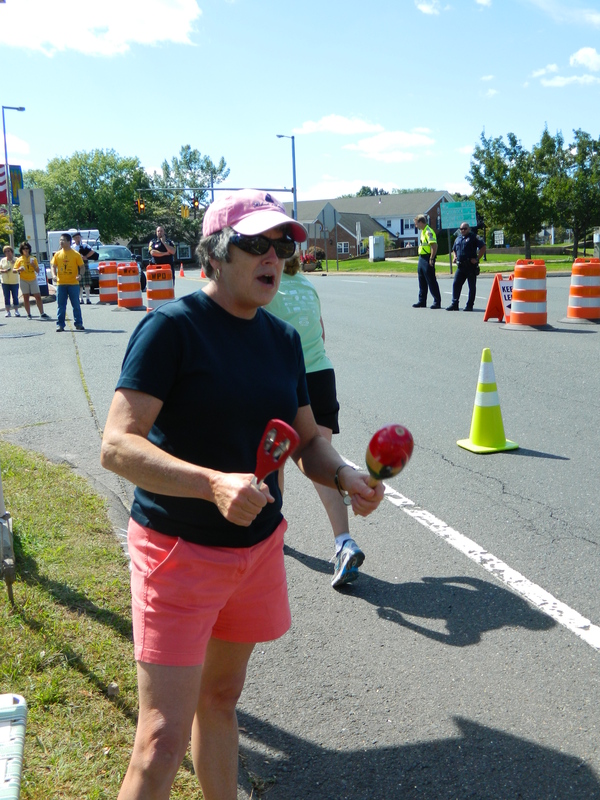 Margaret Korhonen of East Granby, Conn. cheers on the runners. “The Tavern Trot is a ‘must attend’ for us. Either my husband or I, or both of us attend. We have so many connections here, friends, family. We feel very lucky. 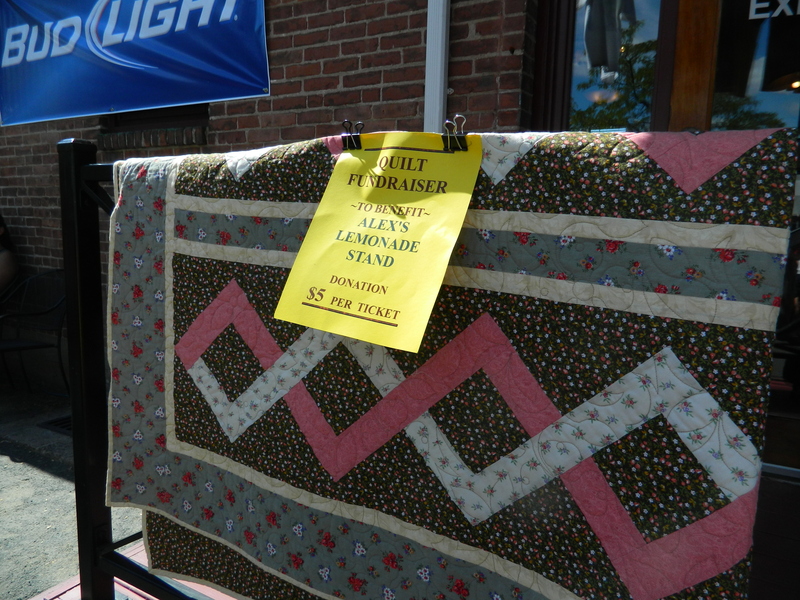 The number of events held for Alex’s Lemonade astounds me, it is humbling. These people get nothing for doing this but just want to help carry on Alex’s work. It is inspiring,” said Liz Flynn Scott. 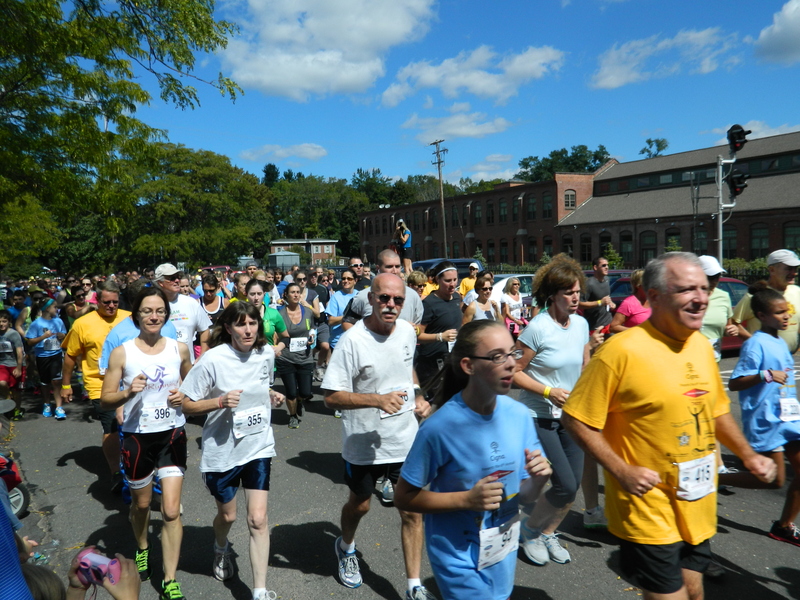 Proceeds from this year’s race will add to the tens of thousands of dollars raised for ALSF by the Tavern Trot since it began. 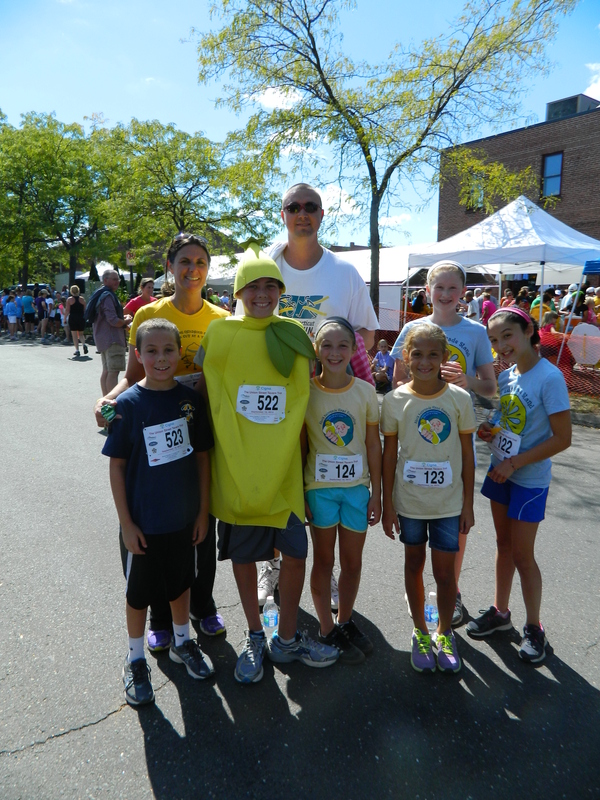 Alexandra “Alex” Scott’s brother Eddie Scott, 14, ran wearing a lemon costume. He is surrounded after the race by family and friends. Gregorgy Weaver wins 6th Annual Tavern Trot. 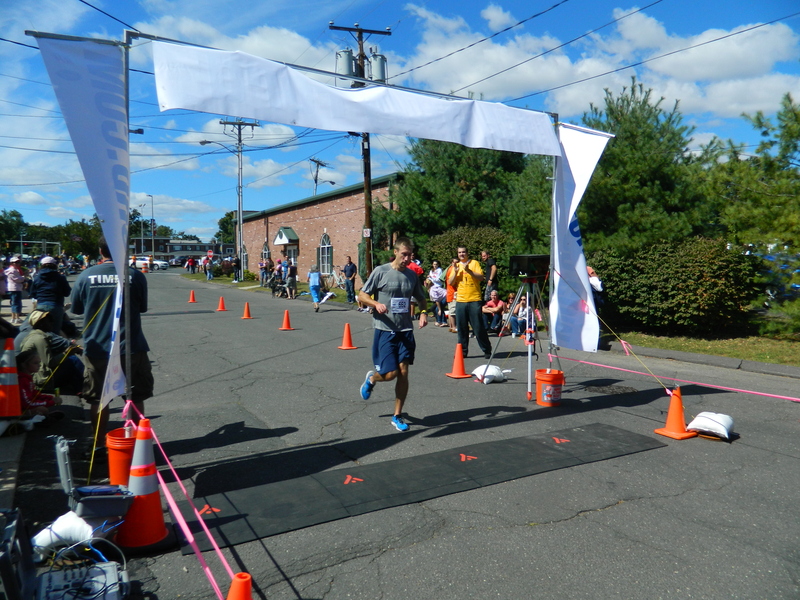 Crossing the finish line first with a time of 19:54 was Gregory Weaver. For the women, Dani Kennedy had the best time, 24:00. New this year, a sensor time clock was added. “This is my fourth consecutive year winning,” said Weaver, 32. Hartford firm of Rogin, Nassau, LLC. 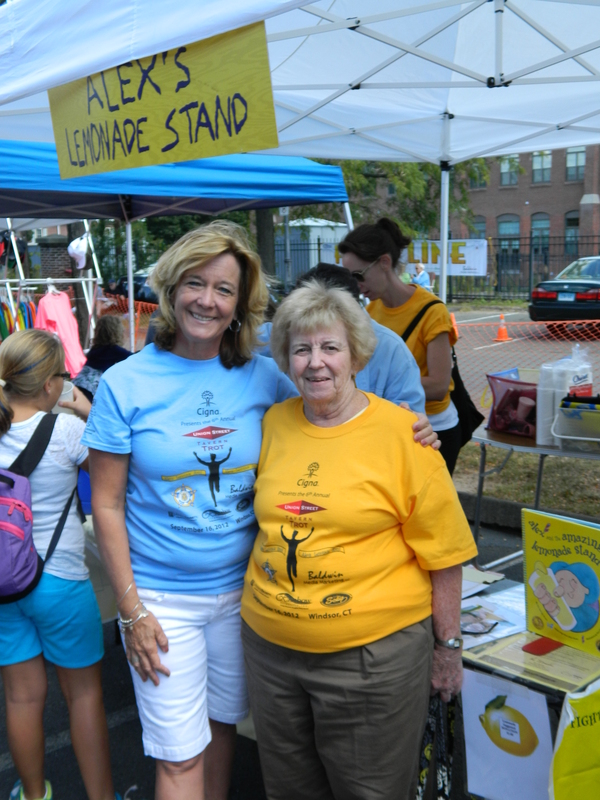 Two Anns making a difference for Alex’s Lemonade Stand Foundation – Ann Baldwin, president of Baldwin Media Marketing, LLC, and, volunteer extraordinaire Ann Walsh. First time participant Brian Cocuzzo. 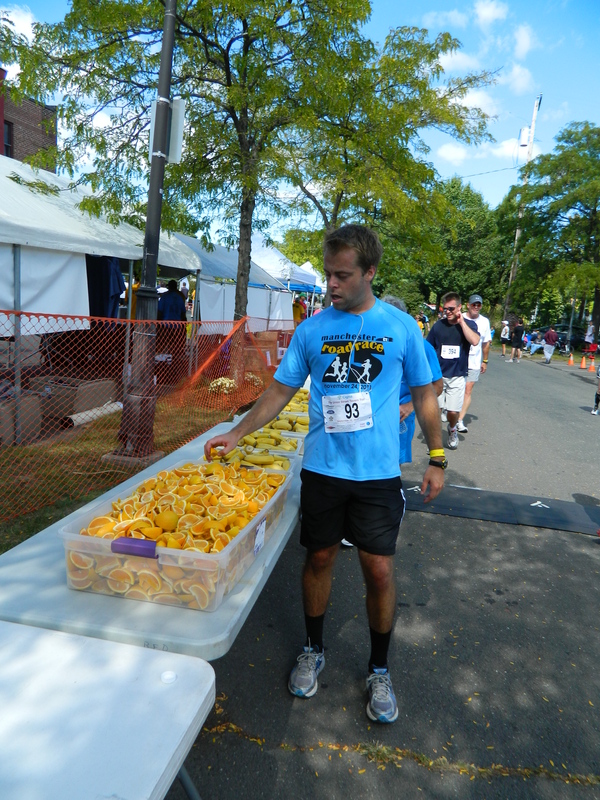 A first time participant, Brian Cocuzzo headed for the table filled with cut bananas and lemon slices available for runners at the end of the race. “It’s mixed, trails and roads so it’s pretty good and there were elevations. It was fun,” he said. 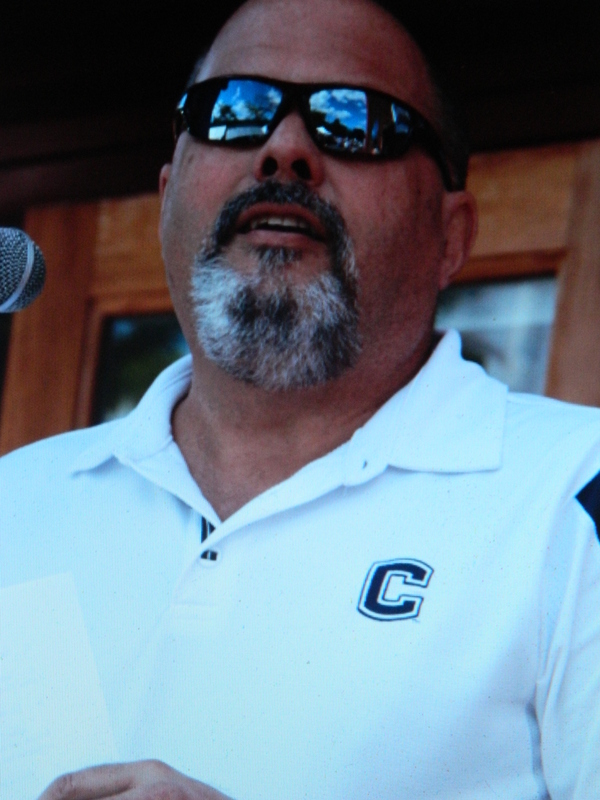 Courtesy photo, Baldwin Media Marketing, LLC: Joe D’Ambrosio, NBC Connecticut sports anchor served as Master of Ceremonies at the Tavern Trot. 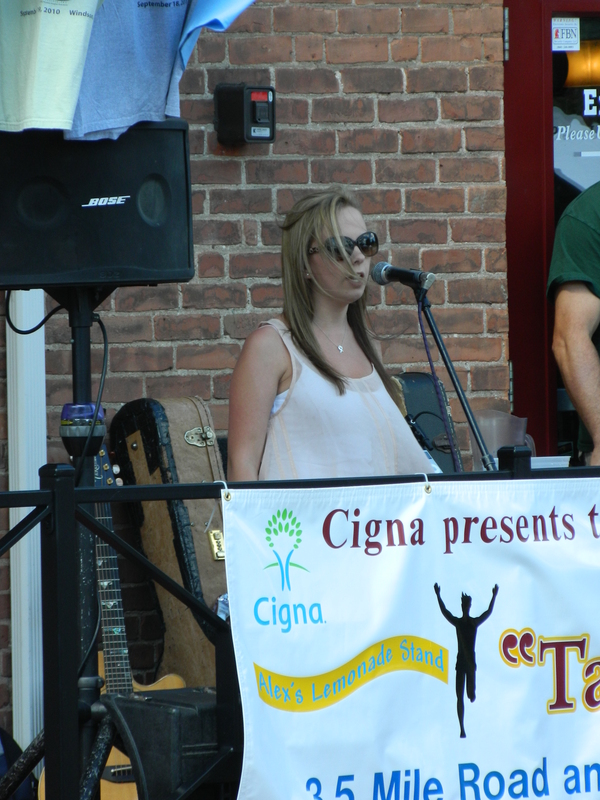 Ashley Marsella sings the national anthem at the Tavern Trot. 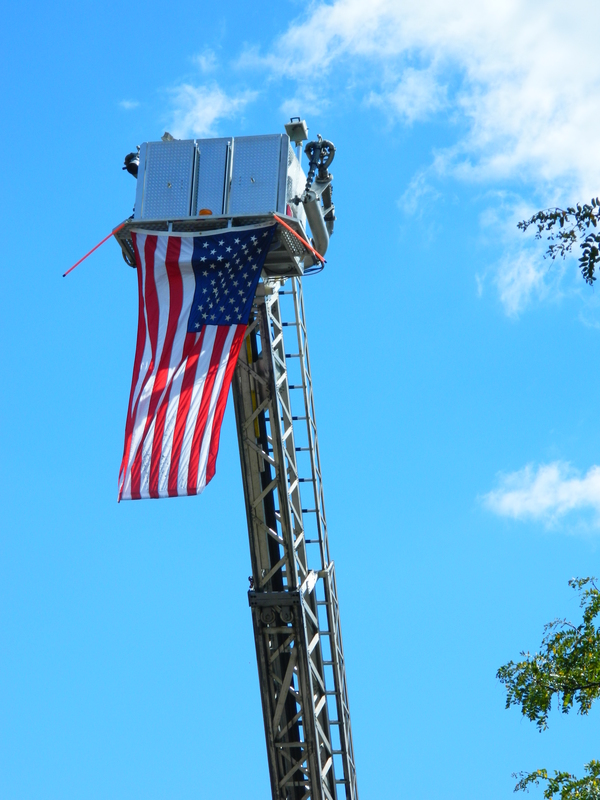 Among the other sights and sounds of the day were: Ashley Marsella who sang “The Star-Spangled Banner”; Joe D’Ambrosio – NBC Connecticut sports anchor and radio voice for University of Connecticut sports – serving as master of ceremonies; the Stars & Stripes flying high above the racers – courtesy of a Windsor Volunteer Fire Department ladder truck; a lovely quilt- hand crafted by teachers Kathy Wakefield and Diane Mullins from Roger Wolcott school- that was raffled off to benefit ALSF; a bagpiper who played on one corner of Union Street where runners approached the last stretch of the race, and, Margaret Korhonen of East Granby who also positioned herself on the oppositie corner, shaking maracas to cheer on the runners. 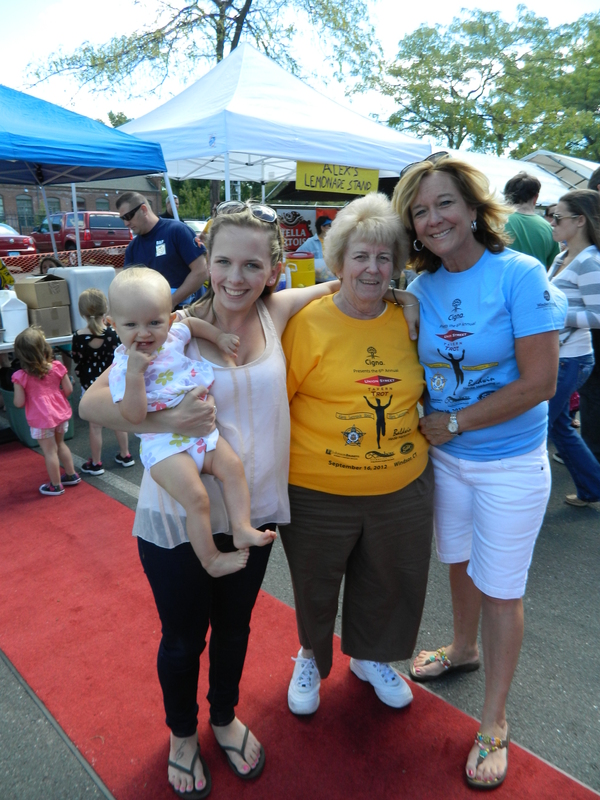 ALSF volunteer Ann Walsh with Pat Flynn, Alexandra “Alex” Scott’s grandfather, both of Windsor, Conn.
Ashley Marsella with her 10 month old daughter, Taylor, her friend Ann Walsh and her mother Ann Baldwin. Another great article highlighting the good things going on in our local community! Your written words and your photos totally captured the beauty of this very successful event! Keep up the good work and thanks for your professional coverage!